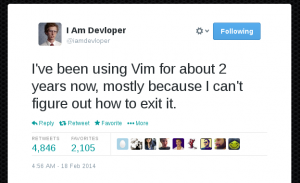 Looking to learn a VIM text editor on Linux or Unix-like system such as MacOS? Look no further. Try resource mentioned in this blog post. A few days ago a friend asked me: “How do I get started with Vim?” She explained to me she tried Vim out for a few days and enjoyed the idea of working inside the terminal, as well as the consistency of the experience across different servers. Good reasons, no doubt. I collected some notes and some links for her which I decided to turn into the article you’re reading. My goal is to suggest a path for starting out with Vim without the anxiety and the frustration this process usually brings about – the editor is not famous for being easy to start with. As I will focus on the path, I won’t be getting into the details of the topics I will cover. There are awesome resources on this matter and I will link them at the end of each section.